Home / Columnists/ Why MPs keep hurting brand Sri Lanka? 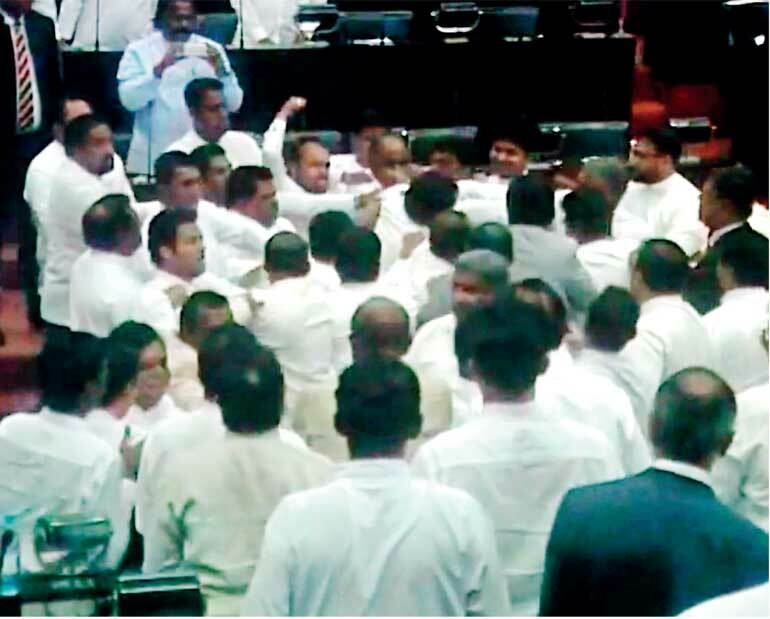 Why MPs keep hurting brand Sri Lanka? When the country voted for change on 8 January 2015, the expectation was that Sri Lanka would see radical changes to the developmental agenda of the country and we would see a new culture of working that would seriously improve the overall value of brand Sri Lanka. However, what has unfolded stepping from the debt that the country has to pay and the manner in which the last Budget has been implemented to the situation that unearthed in Parliament last week shook every peace-loving citizen of the country. This is the brutal reality and incidents like what we saw in Parliament last week and the different protest campaigns that we see across the country on the education front to the different subsidies that were extended some time back and changed in structure now do not auger well for brand Sri Lanka. What many people forget is that people act on perceptions and not on reality and may be incidents like the one in Parliament last week may be absolutely ‘one-off’ but the reality is that the world tends to make a perception from these isolated incidents that does not really reflect the reality on the ground. The best example I can quote is that even after the terror organisation LTTE rammed an aircraft into the building next to a prominent five-star hotel, even after repeated attacks by the LTTE into the city and this terrorist outfit being responsible for wiping away over $ 200 billion from the Sri Lankan economy, the world perception among some quarters was that the LTTE were freedom fighters, which is the duplicity of the world. These same quarters are blind to the fact that way back in 1983, Sri Lanka attracted 338,000 tourists into the country and in 2008 after 25 years was struggling to attract 438,000 odd visitors into the country, while countries like Cambodia which were at 200,000 visitors in 1983 were touching almost two million tourists way back in 2008. This loss in value terms accounts for over $ 6 billion, which is the reality. Today, this same industry is attracting almost three billion dollars and two million visitors with top global brands like Shangri-La, Movenpick, Hyatt, ITC, Shinagawa and Avani setting up business in our land. The point I am trying to highlight is the power of perception being stronger that reality as per the global academics Shifman & Kannuk. On a separate issue, the conditions that the EU wants Sri Lanka to correct before the resumption of GSP+ that was reported in the weekend papers does not savour well, given what Sri Lanka has gone through. But the ability to build credibility in the international power structures becomes more challenging with incidents like what happened in Parliament last week. Let’s accept it. Sri Lanka is challenged this year. We have to pay a massive 4.5 billion dollars in debt payment. The IMF facility will hit the coffers in stages and that is also being monitored before the next trench is released. The overall export performance of the country is wobbling given the tough global economy and the challenges in China and Middle East. My mind goes back to a former boss who told me, “The best surfers emerge in troubled waters.” I guess the time has come for the top corporate sector personalities to work closely with the public to pull Sri Lanka out of the issues we are up against in 2016. But, this will not become a reality unless the private sector sees some degree of positivity in Parliament. There has to be debate but it must lead to decisions and it must lead to taking Sri Lanka forward. From what the country saw last week, this reality does not come through in the media which is very sad given the positivity that Sri Lanka was waiting for post 8 January 2015. The good news for Sri Lanka is that connectivity to the world is working well. We must now build on this and help to correct the key industries like apparel, tea, cinnamon and rubber. The industry that has unleashed the global advertising campaign must help via the umbrella campaign to build the multitude of Sri Lankan private sector brands. A point to note is that every 15 years we lose the top 10 markets in which Ceylon Tea operates. This does not hold stead for an industry that was awarded ‘Ethically Manufactured’ status, which is the first in the world. I guess these initiatives need support on a policy level on the supply chain side so that we can manage the spiralling cost structure. The cynosure of eyes on Sri Lanka is on the new industry IT/BPO which is now ranked a top 10 global service provider by AT Kearney. This business requires a strong branding exercise so that we can wrap the country stronger globally, but the good news is that this industry will be a $ 1 billion industry in the near future. Some of the best names of the business world are coming into the fray with organisations like CGM, a top freight liner, setting up its back-end operations in Sri Lanka with a partnership with Hayleys. Now we must keep all these entries in the Sri Lankan business space given the VAT increase of 15% and the Inland Revenue officials chasing to increase the income tax net. Recently at the Rotary New Generation Seminar, the Governor for Sri Lanka and Maldives shared the insight that Sri Lanka was ranked at No. 10 in the World Giving Index with 92% of Sri Lankans directly or indirectly being part of volunteerism, which explains the uniqueness of the culture of Sri Lanka. I guess the customer satisfaction survey of tourists coming into Sri Lanka stating that over 85% want to come back to Sri Lanka is testimony of the strong branding that happens to a visitor once experiencing our culture. But incidents like what we saw last week in Parliament do not add value to ‘Brand Sri Lanka’. In my view Sri Lanka has got a window of opportunity to the world that is listening to us and believing in us after many years of rhetoric. Now the question is how we pull through 2016. With the economy now closing on $ 100 billion and export revenue from tourism touching $ 4 billion whilst merchandise exports is being targeted to be 20 billion within three to five years, we have got an opportunity to develop a new positioning for Sri Lanka, but this can happen only if we believe and value ‘Brand Sri Lanka’ and this is in our very own hands with actions. We either can lose this golden opportunity or make the best of it. It’s our choice.